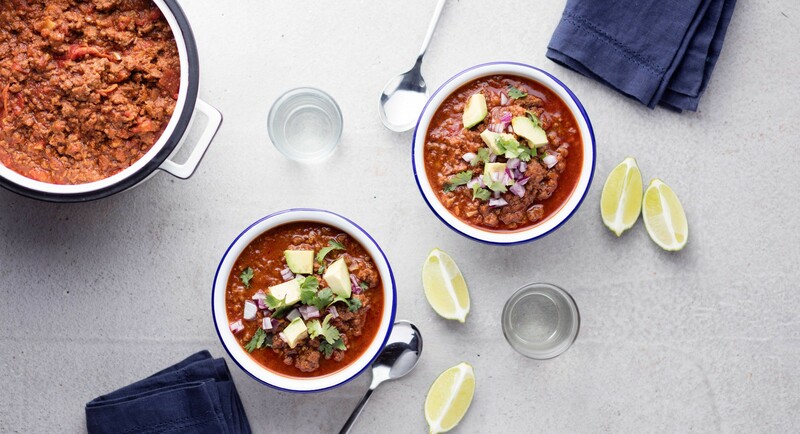 Though many people add kidney beans to chili, the traditional Texas recipe for "chili con carne" doesn't call for any. This Paleo-friendly version follows that tradition, relying on lots of spices and beef bone broth to develop even more flavor. Heat olive oil in a large heavy-bottomed pot. Sauté onion until translucent, about 5 minutes. Stir in minced garlic and ground beef and brown over high heat. Season with a large pinch of salt. Stir in cumin, paprika, oregano, chili powder, red pepper flakes, and cayenne pepper. Cook 30 seconds. Stir in honey, tomato paste, tomatoes, vinegar, and bone broth. Bring to a boil, reduce to a simmer, and cook, uncovered, until meat is tender and broth is thickened, about 2 hours. Season to taste with more salt and serve with a squeeze of lime and cilantro.